I suppose everyone knew that Highway 61 was the road from New Orleans to Memphis (and all the way to Minnesota), and that that’s why Dylan used it as opposed to, say, Route 66 or Ventura Highway. Well, I didn’t, shows how much attention we in Chicago ever pay the South, so it was with a real frisson of being somewhere historic that I took off south out of town on the road where Robert Johnson sold his soul and Bessie Smith died. Such things seem more mythical than real, so to actually be in the places, and to think that they happened within living memory, is less like being where Lincoln or John F. Kennedy did something, and more like being where King Arthur (or at least Billy the Kid) did. But never discount Americans’ ability to trash a landscape, however mythic. Tunica, Mississippi, the first major town on the river south of Memphis, has become a riverboat casino town, and the ten miles either side of it are blighted with ugly new gaming complexes and, even more, billboards for same. 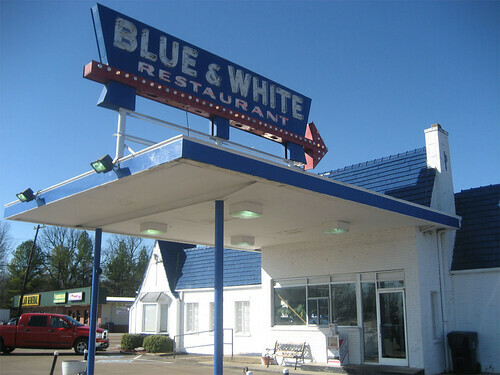 Luckily there is one gleamingly gorgeous establishment predating this fresh hell, the Blue & White restaurant, which by itself redeems this stretch of the road by encapsulating everything the traveler would have dreamed of finding on 61 back in the 40s or 50s. 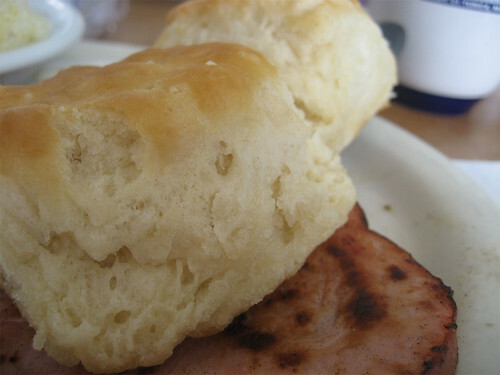 We followed those with biscuits and gravy, grits, country ham— all of it exactly what you hoped for, plain, not gussied up, but damn near perfect of the type. 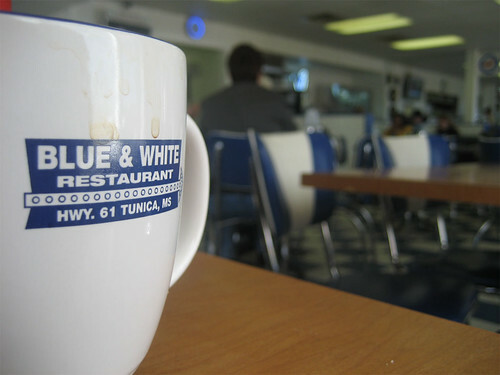 A blue and white vision of Heaven, for anyone with a hellhound on his trail. The terrific museum at Henry Ford’s Greenfield Village in Dearborn, Michigan includes an outdoor “town” consisting of houses and workshops belonging to a lot of his fellow tinkerer-tycoons— Edison’s lab, the Wright brothers’ bicycle shop, etc. It invites you to imagine a small town 1900s America in which every house held a genius— a white, Protestant genius of engineering, that is. Clarksdale, Mississippi is like the real-life black version of Ford’s fantasy— look around this small town and you see the cabin where Muddy Waters was born, the hospital where Bessie Smith died, the house where Pinetop Perkins taught a kid named Ike Turner to play piano— and, more dubiously, the crossroads Robert Johnson supposedly sang about selling his soul at. How did so many blues greats happen to come from (or in Smith’s case, die in) such a small place? I suspect that the question really is, who were the blues greats who we never heard of, because, unlike the residents of Clarksdale, they didn’t live close enough to the train to Chicago to find fame? The train was the one way out of sharecropping poverty, and music was one of the tickets to the train. 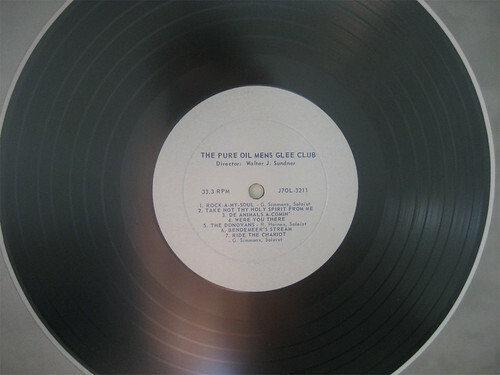 But you had to live close enough to catch it; and so it was mainly by being geographically able to send its best talents elsewhere that Clarksdale got a permanent place on the map of American music. 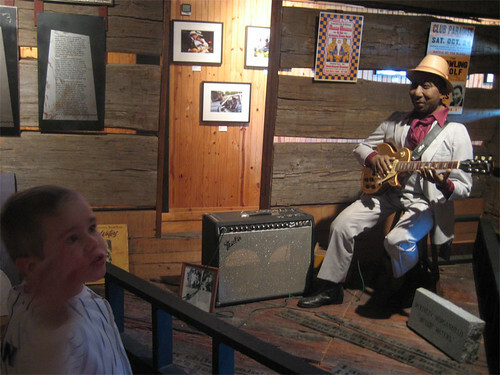 Today there’s a nice museum in the old train station of blues-related ephemera— records, guitars, shiny suits– the star attraction of which is the actual cabin in which Muddy Waters grew up. It’s interesting to note that the cabin, barely more than a pile of lumber, hasn’t actually been donated to the museum; it’s still owned by the white landowning family who, of course, owned it all those years the Morganfields lived in it, working their fingers to the bone but never getting any closer to owning something of their own— until young McKinley took the music they made in their few hours away from farm work, and turned it into international fame and (at least modest) fortune. What bitter irony it must have been for the white owners of the place that they skimmed the cream of their black sharecroppers’ labors on the farm all those years— and then the ungrateful blacks go and create something that’s really worth something, and the whites don’t get a penny from it. It just doesn’t seem right. We’ll lend them the cabin for their museum, but we’re not givin’ anything that belongs to us away. 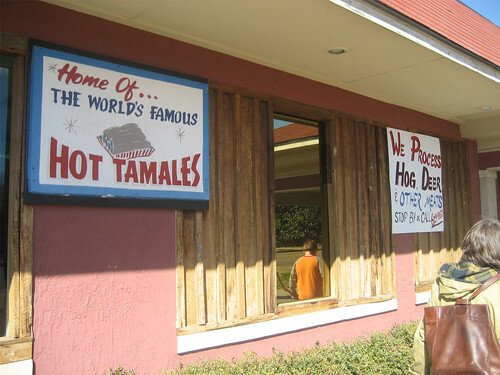 John T. Edge has written extensively on the subject of Delta tamales, a black tamale style which, though it undoubtedly had Mexican origins somewhere, became an authentically black food form over time (see Robert Johnson’s song “They’re Red Hot” for more details). 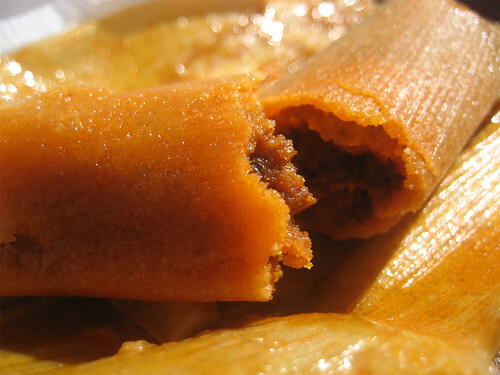 My friend Peter Engler has spent some years trying to establish a link between Delta tamales and the tamales popular in black neighborhoods in Chicago. I think he and anyone else who’s thought about has assumed that there surely must be one, if blues and pork-based barbecue traveled up from Mississippi to Chicago it seems likely that tamales did too, but the problem is the near-total lack of surviving historical evidence for a product that would have often been homemade and sold out of a kettle or a cooler. Peter hunts for Mississippi tamales in Chicago; I decided to do my part for this burning question by seeing how Chicagoan my Mississippi lunch could be. 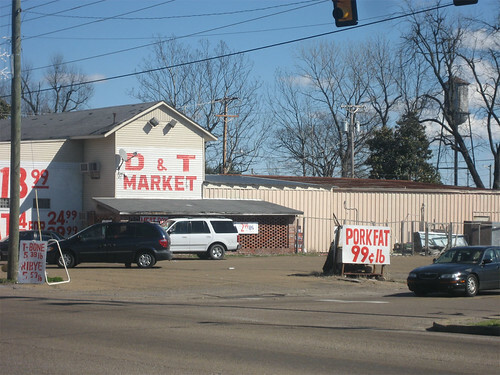 We trekked down the highway, no doubt a preposterous sight as a very white family of four trekked through the dodgier parts of Clarksdale, past the black hospital (my sons immediately started looking for evidence of Smith’s car crash— “I think her car hit this stick and its tire blew up!”), until we reached Hick’s Quality Foods. To add to our preposterousness, they were drive-through only at lunch (one assumes this does not apply to deer in need of processing), and so we ordered a bunch of food— including today’s special of hog maw— and once it was shoved through a tiny window at us, trekked back to a park named, inevitably, for Martin Luther King Jr. to eat it. 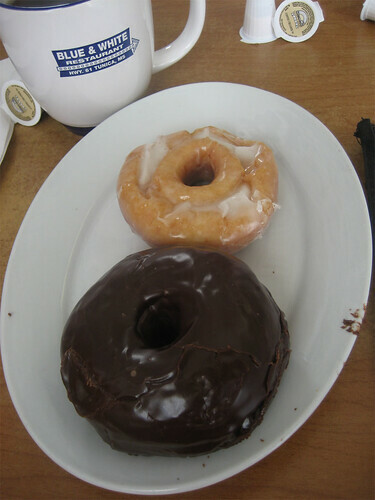 It was the closest thing to Chicago food we ate on our trip. The rib tips could have been straight out of a south side BBQ joint; the (very greasy) tamales were, if not exactly like Chicago style, certainly even less like anything they make in Mexico these days. We may not have found historical evidence, but we were certainly convinced. 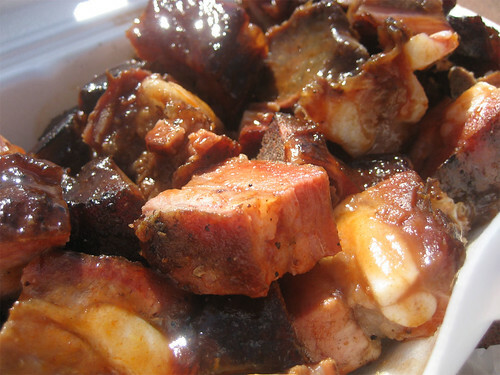 When the blues went north, rib tips and tamales like these went with them, I have no doubt.